Discussion in 'Chainsaw Stickies' started by Bruce Hopf, Jun 28, 2008. I know heimannm has a lot of McCulloch Chain Saws, as well as myself, I was wondering if anybody else has a few McCullochs in their collection of Chain Saws, and are they for work, or for display. Thanks for your input. Bruce. My one and only is a Pro Mac 610 that I bought new in 1988 or 1989. It gets used and abused rather than being a garage queen. In order of motor size I have a mac125 (123cc), model 73 (120cc gear drive), pm1000 (100cc), super44A (87cc), 1-53 (80cc), 250 (80cc), G-70 (72cc), pm610 (60cc) and an early 10-10A (50+cc). All of them get used in rotation then cleaned and displayed until the next go-round. The 73 is a beast with a long bar once you dig the spikes in and push. The 125 is a legend and deserves it. The pm 1000 cuts about like a 660 with a 32" bar on it (maybe a little more guts). the super 44A is heavy but suprisingly quick. The 1-53 and 250 cut about the same and share a bar. The 10-10 is one of the strongest saws in this size segment that I have ever used. Oh yeah..... I almost forgot about the little mini mac 6 top handle. arrow13 and hotshot like this. Yep i got a couple. Not working any, Just for show and play. Here is an old picture but there are a few of my Mac 2 mans in it. 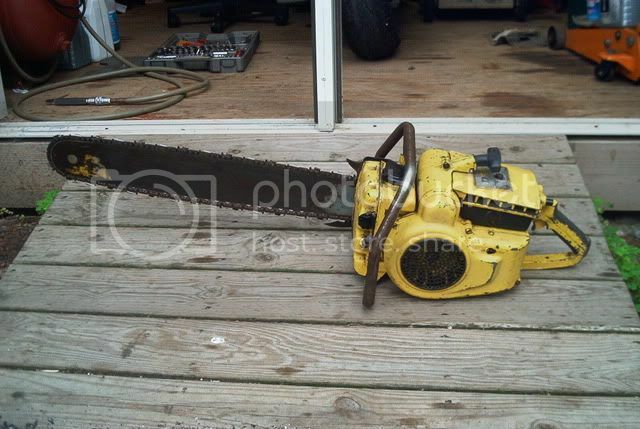 I collect Mcculloch chainsaws of all sizes and shapes until the J.F. generation. No pictures just a lot of saws. Mini-Macs - 125s, any of them. Do not find many around here but when I do I usually try and buy them. Most of my smaller Stihls, Pioneers and Homelites will go away soon to make more room for Mccullochs. Had a good run of luck finding 1-10 and 10-10 series saws early this year and then no more Macs to be found again. It gives me something to look for. I just have my one pro mac 610. I still need to go through the carb and replace the fuel line. It looks good just sittin' there right now ! No, but I want an sp 125 for the hell of it. backhoelover, RandyMac and Urbicide like this. I have a 1-86 Mac that is a beast. I have run it a few times. With the 3 to 1 reduction the chain speed is very slow. It seems to be for occasional use. It weighs 32 pounds plus the bar and chain. It sure sounds healthy when it fires up. 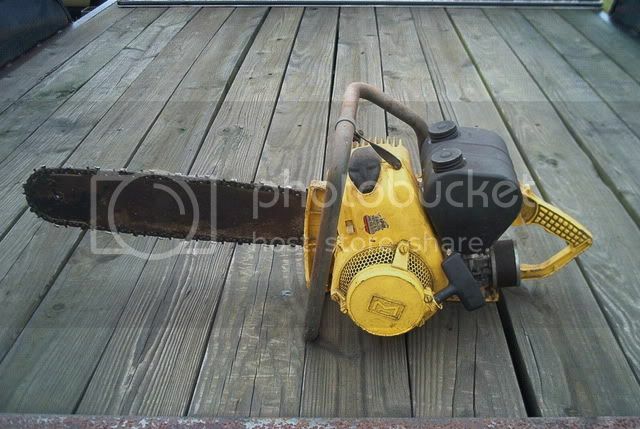 I have a healthy respect for the guys that ran saws of this size for a living. P.S It sleeps in the basement on a coffee table now, But still ready to go at a moments notice. hseII and Walter Glover like this. 1sp125c 2 sp125s with 101s and a hotsaw with a 93, I like macs. Urbicide and chowdozer like this. Hey Excess, technically hops are flowers not vegetables. Thanks Bruce for getting this started. In my signature line I list only my runners. I do use a few of them from time to time, like the SP125C's for some big stuff, I really like the sound of the 1-85 so I use it when I get a chance as well. Most of the rest are just to fire up and listen to while I make a few cuts sometime during the year. I hope to make the 740 into a work saw as well but in all honesty, with the Stihl's and the Jonsered's running well I don't really want to use the big McCullochs all that much. My goal is to get one of every 1 man saw from 1948 -1970 or so. At the present time I have the complete 1-40 series, with a recent e-Bay purchase I now have the complete 1-50 series, and a good start on the 1-60 series, a long way to go with the 1-70 and 1-80 series saws. Somehow I missed on a 550 this week but have another chance coming up there. I need a 250 Super to fill out the bottom end of the 3 number saw (200, 250, 300, etc.) and a lot of empty spaces from 550 on up. As I showed in an earlier thread, I have built some additional shelves to display my saws and have at this point about 40' of empty space available at present. If anyone out there has something they want to move along please do let me know. I might even be willing to trade one of the extra's that I have for something that will fill in a blank. In my signature line I list only my runners. I do use a few of them from time to time, like the SP125C's for some big stuff, I really like the sound of the 1-85 so I use it when I get a chance as well. Most of the rest are just to fire up and listen to while I make a few cuts sometime during the year. I hope to make the 740 into a work saw as well but in all honesty, with the Stills and the Jonsereds running well I don't really want to use the big McCullochs all that much. If anyone out there has something they want to move along please do let me know. I might even be willing to trade one of the extras that I have for something that will fill in a blank. Mark, Glad to help. I've seen other threads, of other Brands of Chain Saws, but no threads for Mcculloch. So I thought it was time to start. I was wondering who else had a collection of McCullochs, other than you and myself. I was surprised to see so many posts. Thanks to all that have, and will be answering to this thread. Bruce.